Dr. Louis Ignarro discovered "the atom" of cardiovascular health--a tiny molecule called Nitric Oxide. NO, as it is known by chemists, is a signaling molecule produced by the body, and is a vasodilator that helps control blood flow to every part of the body. Dr. Ignarro's findings led to the development of Viagra. 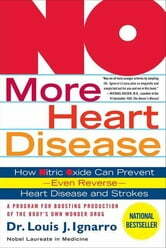 Nitric Oxide has a beneficial effect on the cardiovascular system as well. NO relaxes and enlarges the blood vessels, prevents blood clots that trigger strokes and heart attacks, and regulates blood pressure and the accumulation of plaque in the blood vessels. Dr. Ignarro's current research indicates that Nitric Oxide may help lower cholesterol by facilitating the actions of statin drugs like Lipitor. The goal of the regimen presented in NO More Heart Disease is to age proof the cardiovascular system, keeping the vascular network clean and elastic through enhanced NO productivity. The plan is easy-to-follow without extreme lifestyle adjustments, involving taking supplements to stimulate Nitric Oxide production, incorporating NO friendly food into the diet, and a moderate exercise program.